Sooner or later if you crawl in the rocks you will probably want hydraulic ram assisted steering. If you can hear your pump whining and crying every time you get to the rough stuff, then the ram is for you. We highly recommend these for rock crawling Broncos with 35" and larger tires. Steering force will increase 100% or more. The ram assists the steering box and pump so that they do not have to work as hard. Because of vast differences in tie rod and drag link systems, you will need to decide how and where to mount the ram. We will provide some simple guidelines but the rest will be up to you. Therefore some fabrication and welding skills will be required for the installation. 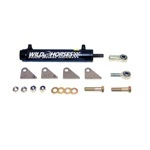 Our Ford 2WD steering systems are available with ram capabilities. This is a good option to have even if you don't get the ram at the same time as your steering system. Having the adaptations on the box will allow for ram mounting at anytime should you decide to upgrade. The ram kit will include the cylinder, rod ends and mounting tabs. Our rams use a 1 3/4" bore with an 8" stroke and a 3/4" shaft. 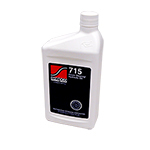 These cylinders are specifically designed for steering, they are not cheap farm equipment cylinders. 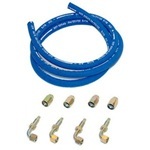 The ram hose kit can be utilized with the cylinder and box in various mounting positions. 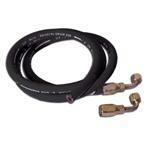 We supply reusable fittings and high pressure hose which can be routed as required to fit your application.